THE core of the La Salle volleyball squad will suit up as Meralco in the Philippine Super Liga Grand Prix. DLSU Lady Spikers Mika Reyes, Kim Fajardo, Cyd Demecillo, Carol Cerveza, Mika Esperanza and Majoy Baron will wear the Meralco uniform together with veterans Cha Cruz, Paneng Mercado and Camille Hernandez in the import-laden conference opening on October 10. 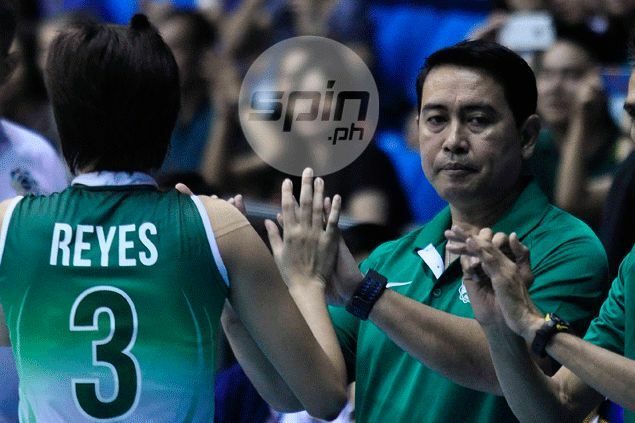 "Yes, we will be joining as Meralco," said Lady Spikers coach Ramil de Jesus, who called the shots for La Salle-powered AirAsia, Generika and Shopinas in the previous editions of the tournament. A source confirmed La Salle's participation. The team, however, has yet to decide on who will reinforce the star-studded squad. "They have a list of imports from Brazil, Cuba, Italy and United States," said the source. "At any rate, Meralco-DLSU will be one of the teams to watch in the Grand Prix. Aside from their chemistry, they are young and aggressive. I'm sure they will give other teams a run for their money." Petron will look to defend its title, while also set to see action in the PSL Grand Prix are Phillips Gold, Foton, Cignal and three-time champion Philippine Army, which will be bringing back Tina Salak, Mary Jean Balse, Jovelyn Gonzaga with new recruit Royse Tubino in its return after a brief absence.